Just 10 months ago this playground and surrounding school looked very different. “They were cemented into the ground and just completely blew off,” Terry Bertolino with Gifft Hill School said. Terry Bertolino calls herself the the sole member of the building and grounds committee. As she shows us around at Gifft Hill School lower campus. Just last year they were hit by both Hurricanes Irma and Maria. 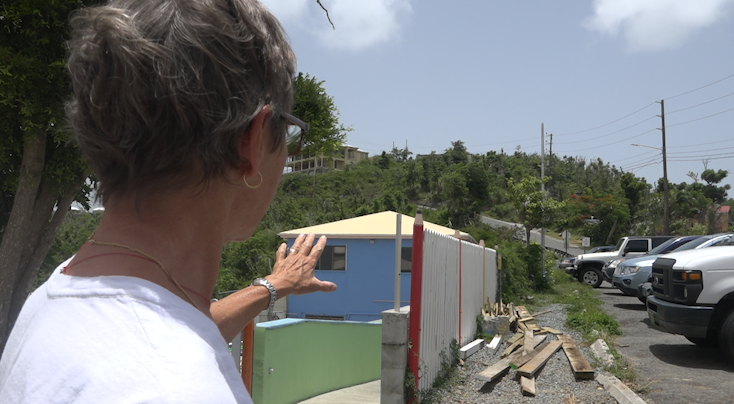 “We had a tremendous about of debris and damage, not so much damage but debris,” she added. Like a parking lot full of it, along with blown out windows and damaged ceiling tiles. Bertolino said without the volunteers they wouldn’t be where they are today. Updated classrooms painted with bright colors, give new life to the 40 year old school. Along with touches of the old that bring the new and the old together. As Gifft Hill School readies to open its’ doors for a brand new year, you find its’ the spirit the carries them forward.